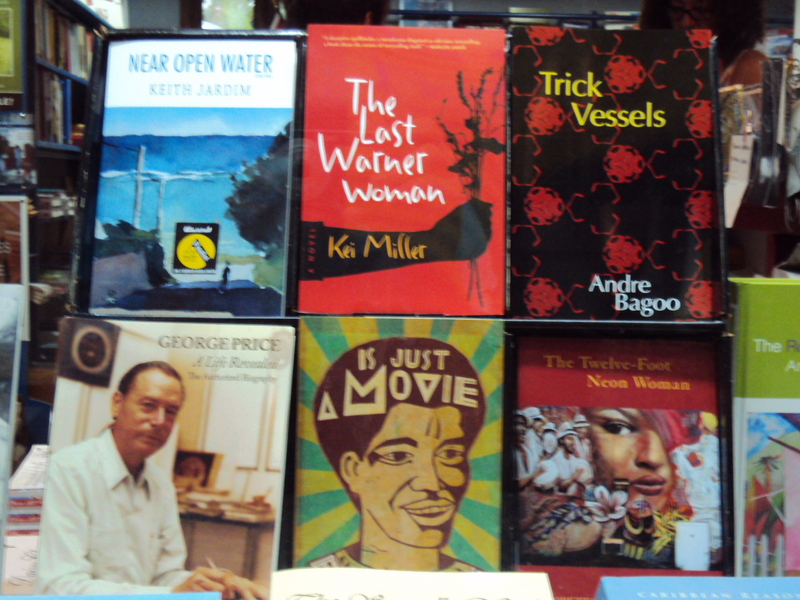 This year's shortlisted titles (bottom row) on display in the bookshop window! A few days before the adrenaline high of the 2012 NGC Bocas Lit Fest was launched, I had the opportunity to sit in the lobby of the Hotel Normandie with Joan Dayal, the proprietress of Paper Based Bookshop, which occupies a cozy nook of the hotel foyer. It’s a little disconcerting to me that more Trinbagonians don’t know about Joan and her shop, which is one of the reasons I felt compelled to interview her in the first place. Paper Based shouldn’t be a well-kept secret, as romantic as that notion seems… it is a supportive bastion for all things Caribbean and literary. Really, when one thinks of acquiring the next Earl Lovelace novel, or the upcoming release from a promising, fresh regional talent, Paper Based is the place to turn, first. The heart of what fuels a business founded in books, Joan tells me, is a love of reading. She’s quick to add that many other pragmatic concerns must run alongside this bibliophilia, otherwise one might find oneself at the helm of a sinking ship. Thankfully, that sort of demise seems never to have been on the cards for Joan, who runs her establishment with generous helpings of acumen, of a keen investment in the literary pulse of the people, of a solid commitment to research in reading trends. She has kept in touch with what readers want to read, with how readers appreciate the feel of a bookshop that’s not mired in profit margins, in a way that I daresay larger conglomerate booksellers tend to miss. Gorgeous ARC magazines proudly preening! 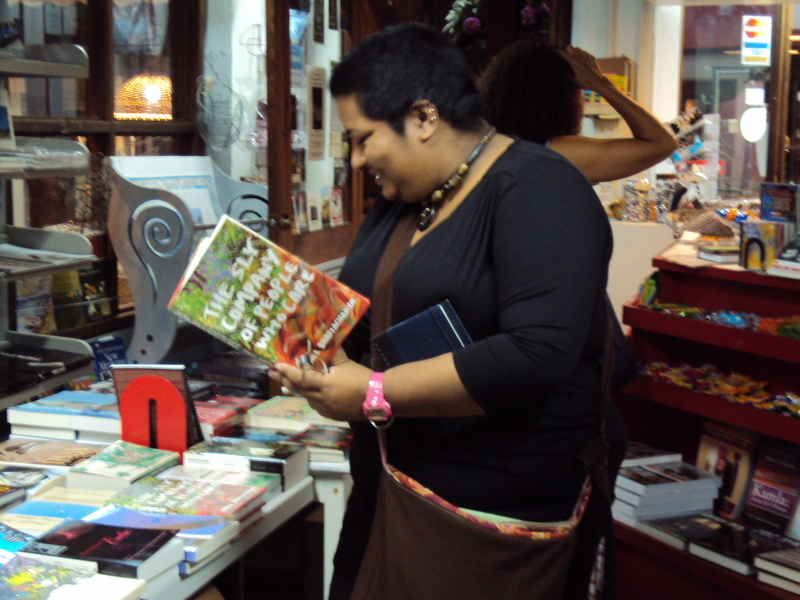 Joan and Paper Based’s loyalty to the Bocas Lit Fest has its roots in the very reception of the idea of an inclusive literary festival on these shores. She tells me of her early talks with festival director Marina Salandy-Brown, wherein the two lamented the dearth of ground-level, home-brewed celebrations of our islands’ writers, readers and publishers. What distinguishes their conversations from so many that are had, cross-island, about the state of local literary appreciation, is that Salandy-Brown, along with a core collective of supportive individuals (of which Joan is and continues to be a proud member) purposed to actually do something about it. 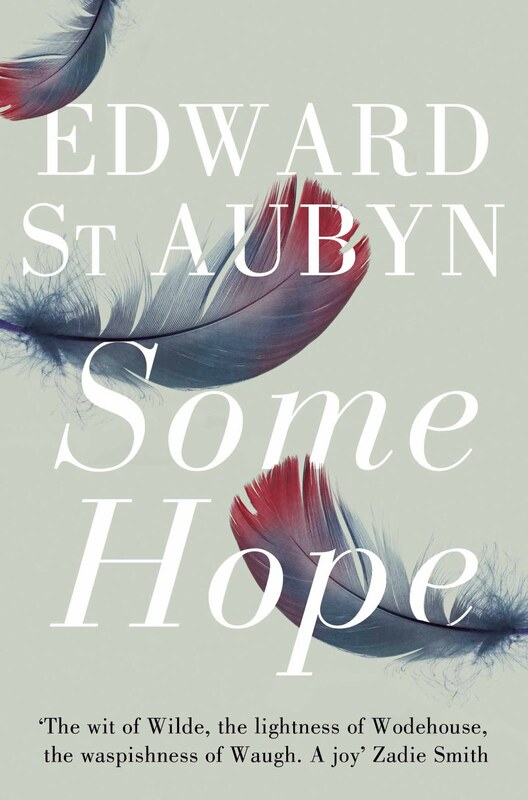 The result is what we’re currently enjoying – four unfettered days and nights of bookish delight, and a festival calendar that extends far beyond this event-crammed long weekend. Joan is visibly proud when she speaks of Paper Based’s role as the festival’s booksellers’ coordinator. I imagine of how difficult it would be to encounter this warm enthusiasm in an impersonal, unapologetically commercial paperback pusher, and, even mid-interview, I’m flooded with gratitude for the very existence of Paper Based – a telling marker that Joan is doing multiple things right, in an age where brick and mortar bookstores are literally crumbling beneath the yoke of financial sustainability, both home and abroad. Times are hard, we both agree… but the people keep reading. As I’d hoped it would, my talk with Joan really runs the gamut. We muse on the evolving trends in publishing, principal among them the rapid ascent of the e-book’s popularity, of the fact that Kindles, Nooks and Kobos have become as indispensable as mobile phones to so many. We discuss the difficulties inherent in sourcing book orders from foreign countries, and the exorbitant costs of shipping, issues which have been aired at the inaugural meeting of the Caribbean Literature Action Group (CALAG), which convened one day before the festival launch. With bold, necessary initiatives like CALAG and the Bocas Lit Fest on the rise, the future seems bright for the world of Caribbean arts and letters, doesn’t it? In the midst of this, Joan reminds me, it’s important to continue encouraging our vibrantly promising talent, a mission to which Paper Based has dedicated itself over the years. A certain book blogger poring over Rahul Bhattacharya's novel, The Sly Company of People Who Care. A bookshop loved equally by both readers and writers, Paper Based held its 25th anniversary celebrations on March 3rd, to a deeply appreciative audience. Andre Bagoo, one of this year’s featured festival writers, had his work read by Barbara Jenkins and Jaime Bagoo. Other writers sharing their work included novelists Lawrence Scott (who read from his forthcoming poetry collection), prolific and celebrated author Earl Lovelace, winner of this year’s fiction category prize for Is Just A Movie, and poet-academic Jennifer Rahim. From every description I’ve heard of it, it sounds like it was a fantastic event, and I’m dreadfully sorry to have missed it. I’ve since resolved to make up for it by attending every single future Paper Based event that occurs while I’m present in Trinidad. 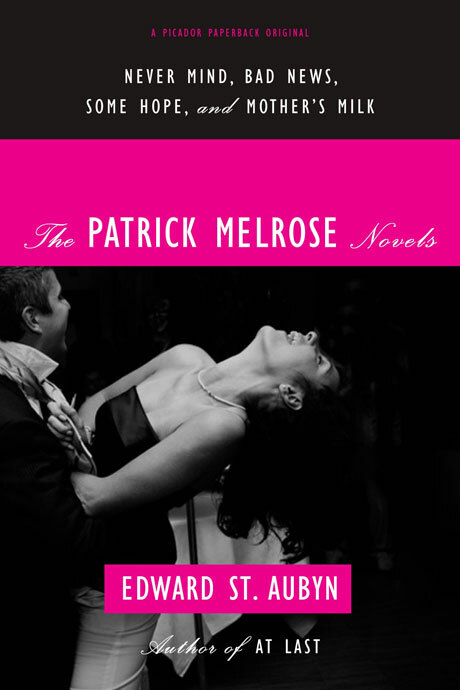 Having been to a couple in the past, I can attest to the knowledge that they are a rare treat for those who enjoy author-reader interaction and stimulation. It is quite impossible to wish someone like Joan Dayal anything but all the best, given her quiet generosity, her unflagging devotion to our regional arts, and her personal investment in our nation’s attitudes to reading, and so I wish her the bookish best, repeatedly! Here’s hoping that Joan and I can sit down in another twenty-five years, to chat once more about Paper Based’s rousing, and encouraging, successes. Many thanks to Joan Dayal for her willingness to be interviewed, for her generosity in response and availability. This interview was originally posted on the Bocas Lit Fest blog. Photos by Keroy J. Chee Chow. 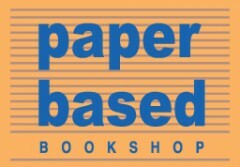 Paper Based Bookshop is located at The Normandie, 10 Nook Avenue, St. Anns, Trinidad. Its opening hours are Mon.-Fri.,10.00 – 18.00, and Sat.,10.00 – 16.00. To get in touch, you can call the shop, at +1 868.625.3197, email at paperbasedbookshop@gmail.com, and visit the well-updated Facebook page.